Dry Creek produces some great Zinfandels, the best of which come from old vines. This example gives a great jammy concoction of blackberry, raspberry and a hint of cherry on the nose and a lovely long peppery vanilla finish in the mouth. The higher alcohols of this wine do not destroy the flavours instead they enhance them This is a big wine. For the price this was a surprising wine and one which went down really well with BBQ. Patience is invariably rewarded when it comes to good wines. In this case cellaring has turned this wine into a great classic Napa Cabernet. The initial nose is deep black fruit with the wonderful cigar box which is indicative of a great cabernet. On the taste you get this wonderful vanilla and expresso secondary flavour which supports the overall blackcurrant style. Great wine with food and needs to be opened about an hour before drinking. The year started well with this great vintage wine. 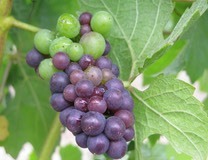 The grapes come from the George III vineyards owned by the Beckstoffer family and date back to the 1800's. The wine is probably at its peak now but has benefitted from being cellared. The nose if of deep blackcurrants and hints of raspberry. When you drink it there is a wonderful vanilla and spice underlay while still laden with that rich dark fruit. The tannins have almost disappeared and the wine is plush and like an easy chair ! A thoroughly good start to the year.